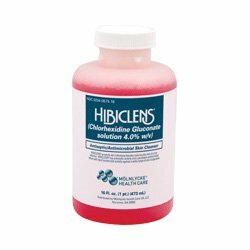 Hibiclens 16 oz. bottle surgical scrub. Contains 4% Chlorhexidine Gluconate (CHG). A liquid surgical scrub, patient pre-op skin preparation, healthcare personnel hand wash, and a skin wound and general skin cleaner. A trusted leader in antimicrobial cleaners, bonds with the skin to create a protective, germ-killing field. In addition to the fast acting antimicrobial effect, HIBICLENS' non-drying, low skin irritation potential promotes compliance with the frequent hand washing associated with today's clinical protocols. Manufactured by Molnlycke.